On the surface this race should be Emerald’s to lose. She is an incumbent, is slated to get the Democratic Party's endorsement, and will certainly get Labor's backing. However, the dynamics of District 9 don't lend themselves to the traditional Labor campaign or the campaign Marti ran in '08. This is a wildly diverse district with many electoral wild cards that can twist turnout scenarios in cartoonish ways. Resentment from some community members over Emerald moving into District 9 for an "easier" run is present. And there is stronger resentment from some members of the Latino community who feel that D9 was drawn to create more minority empowerment and not be a safe seat for an incumbent. Word on the street is that some heavy hitters in the community are actively seeking out other candidates and willing to significantly back them against Emerald. This isn't about being anti-Emerald but about whom can best represent the newly unified City Heights community. This could explain Gomez candidacy coming from the left. A majority Latino district may need Latino representation. 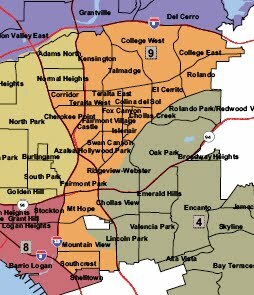 Martinez and Eaton appear to be community based candidates that a district centered on City Heights desperately needs. And Emerald has the experience. We'll see whom else jumps in. Until then, this race is anybody's game.